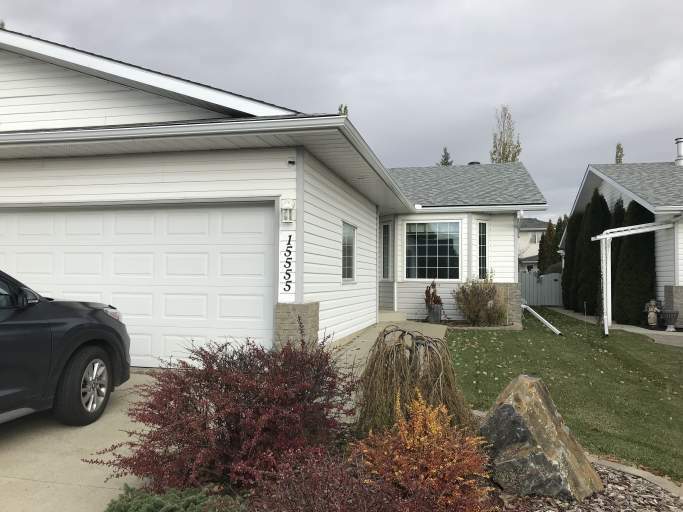 This bright and spacious bungalow style half duplex is nestled in the quiet and convenient Hollick-Kenyon neighbourhood in NE Edmonton and is located in an adult only (45+) community! With tons of options for shopping and restaurants nearby, and easy access to Fort Road and the Anthony Henday, you'll fall in love with the area! The unit itself offers over 1150 square feet of living space and tons of conveniences including main floor laundry, an attached double garage and a beautiful private deck! The unit features a large living room with a vaulted ceiling and laminate flooring and a functional oak kitchen with newer appliances, including a fridge, stove, and even a dishwasher! Down the hallways you'll find the master bedroom which offers tons of space and its own private 3 piece en-suite bathroom which boasts a walk in shower and double vanity with quartz countertops! Another large bedroom and another full bathroom finish off this main level. The basement is partially finished, perfect for storage or an office area. Don't miss out on this amazing unit! Call today to schedule a viewing!